Another week, another soulcrushing announcement of Disney’s intent to take your childhood animated movies and render them in flesh: the great behemoth has cast its eyes upon The Sword In The Stone, and determined that it would be 100% better with actual humans rather than its foolish, two-dimensional sorcery! 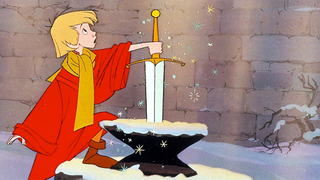 The news comes hot on the heels of last week’s news that the company’s live-action trend has added Aladdin to its list of things to remove the magic from update, with a prequel about the Genie’s origins—but this time, we’re stretching far back to the 1963 classic about a young King Arthur being mentored by Merlin, the last movie Disney released before Walt Disney’s death. Naturally, the sword-and-sorcery epic has tapped Game of Thrones writer/producer Brian Cogman to pen the script for the movie, while Brigham Taylor—who is also working on the company’s Jungle Book remake—will produce. Please look forward to 20 years from now when we get the announcements, directly beamed into our cyber eyeballs, that Disney is re-remaking all of these live-action remakes into animated films. For now, let’s just wait another week for Disney to announce another live-action remake, shall we?